Hudson Scott and Sons had moved to James Street in 1869, as an expansion of the English Street stationers. By 1886 the firm had moved on to printing onto tinplate and began to produce tin boxes. Hudson Scott, tinplate box manufacturers, first engaged with war work during the Boer War by securing a contract with Cadbury’s to produce a chocolate box bearing a greeting from Queen Victoria. The tins were sent out as a New Year gift in 1900, for the soldiers fighting in South Africa. For this service the company received the Royal Warrant. Upon the outbreak of war in 1914 Hudson Scott was doing good business and was one of the city’s key industrial employers. 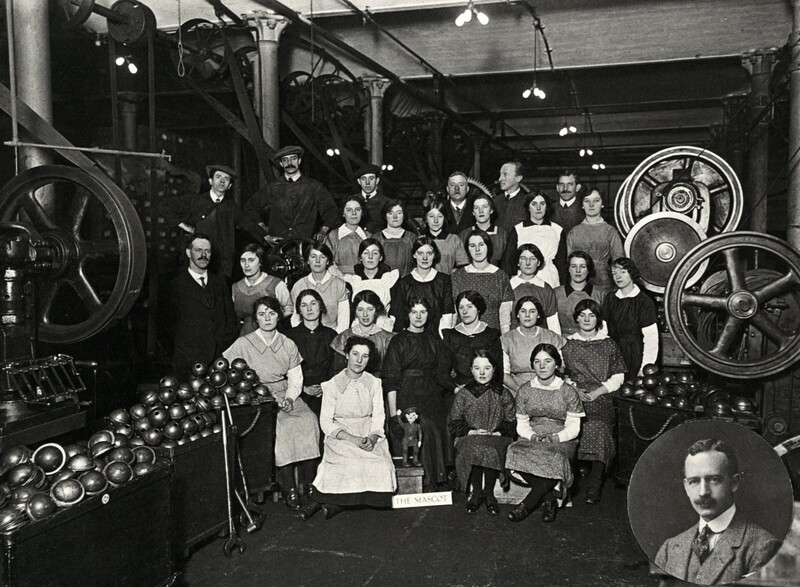 Many of the younger men employed at the factory were among the first in the city to sign up for service, and in order to keep up with demand, their posts were filled by married women. As many of the women’s husbands were employed or in active service, a crèche was set up in the factory to care for the workers’ children. Demand for Hudson Scott’s products was not only maintained, but in many ways increased during the war with heightened production of food containers, mess-tins, water bottles and ammunition boxes. Hudson Scott’s clearest contribution to the war effort came in response to the 1915 Munitions Crisis. Britain was woefully unprepared for a conflict on the scale of the Great War, despite rumblings on the Continent for many years. David Lloyd George, in his post as Minister of Munitions, actioned the Defence of the Realm Act, which enabled the government to take control of any business for the benefit of the war effort. Hudson Scott and Sons went into production of bomb and shell cases, quite opposed to the company’s pacifist, Quaker origins. As well as performing vital war work manufacturing Hudson Scoot continued production of tins, with a number of new designs related to the war. The catalogue lists designs such as ‘Dardanelles’, ‘Allies’, ‘Rheims Cathedral’, and the ‘Cloth Hall at Ypres’. A new avenue of production also opened up as a result of the conflict. Before the war, the majority of toys in the country had been imported from Germany. Obviously this supply disappeared in 1914 and Hudson Scott exploited the opportunity, taking over a factory in Workington and producing metal toys, including luggage trucks, grenadiers and sentry boxes. Alongside the company’s war work, as a leading industrialist in the city and in his role as Deputy Major, Sir Benjamin Scott was an important member of Carlisle Citizens' League. The Carlisle Citizens' League coordinated the city’s responses to war including fundraising, recruitment drives, the establishment of munitions works and the provision of housing for refugees, including using four Hudson Scott workers' cottages on James Street.